The first Hawkeye of the Marvel Universe collection was combined with the super villain Piledriver in a Secret Wars Comic 2-Pack. Unfortanetly this Comic Pack is highly wanted and a limited production makes it hard to get. Mint in package it is worth about $60. 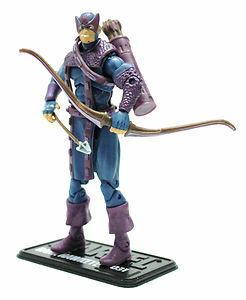 Fans who are not so lucky have to be satisfied with the Dark Hawkeye (see picture) or the Avengers Movie Hawkeye. I prefer the old school Hawkeye.